Google autocompletes have got to be the best thing since autocorrect. (You thought I was going to say sliced bread?) Autocompletes use an algorithm to predict what information you're looking for. They are a helpful tool sometimes, but sometimes they're just plain bizarre, providing a rare glimpse into the collective psyche of Google users everywhere. 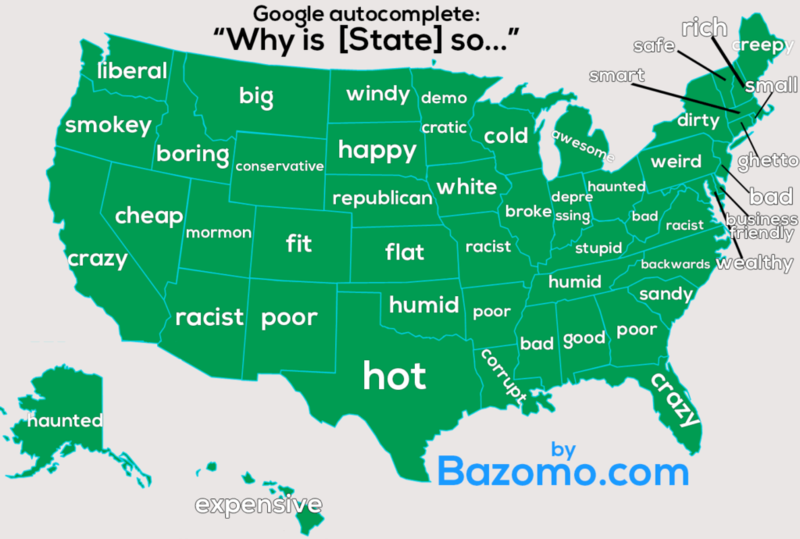 Bazomo recently published a map of the most common autocompletes for every state. The way they did this was pretty straightforward. They simply typed "Why is (state) so..." and let Google finish the question. First there's the obvious ones: "Why is Texas so___" yielded the word "hot," which is a pretty reasonable question. However, some states have some truly baffling reputations, apparently. Over to the left you'll see the question, "why is Alaska so haunted?" I don't know about y'all, but I never realized ghosts were an issue in Hawaii. Also, apparently some people think Indiana is depressing and New York is dirty. Bamozo also shared their exhaustive list of autocompletes, in case you wondered what else people wonder about your state.